Oakwell has undergone substantial redevelopment in the last 5-6 years with three new stands and only the old main stand remaining. The capacity is currently 23,000 with between 1,000 and 6,000 seats for away supporters, depending on the following of the visiting team. Away supporters are usually accommodated in the North stand. This stand offers excellent unrestricted views, good facilities, and is ideally placed for the Queens Road car park. The remaining stands (...South & East) are both very impressive, and would not look out of place in the premiership. The club superstore is located within the 'van damme' stand, which is opposite the North stand (...where the away fans are located). This superstore looks very impressive, and was very popular on the day we visited. Exit the M1 at junction 37, and then simply follow the signs for 'Stadium / Metrodome' and Queens Road car park (...see area details). This route is best if you are travelling from the south. Exit the M1 at junction 36 and follow the A61 into Barnsley. When you reach the outskirts of the town, remain on the A61, heading for Wakefield. You virtually pass the ground, and see loads of signs for 'Stadium / Metrodome'. There are two advantages with this route, the pubs (...see pubs), and the Yorkshire views which I must say add to the atmosphere of the day! The bus & railway station is approx. 10 mins walk from the ground, away from the town centre, along Pontefract road, and up Grove street (...or just follow the crowd on a match day). Away fans are 'encouraged' to park in the large car park at the end of Queens road. This is about a five minute walk from the ground, and ensures that away fans approach the ground from the correct direction. There is also a large club car park located in Pontefract road, directly in front of the club superstore. This costs £2.00 a car, and is operated on a first-come-first-served basis. There are several multi storey and surface pay & displays between A61 roundabout & Dodworth road, off the inner ring road (approx. 15 mins walk through town centre, via bus station to Oakwell stadium). This restaurant and bar is located at the Metrodome Leisure Complex. This bar is easily found (...as the Metrodome seems to be signposted from everywhere! ), and offers good beer & food. During our visit, they were serving 'hot meat Baguettes', which were great value for money. The atmosphere was good with a mix of home & away fans and we can recommend the balcony. This offers superb views of the Yorkshire dales, and you can literally see the away section of the ground from here. Away fans are 'encouraged' to park in the Queens road car park, and the Rigby's is then the closest pub. If you follow the Fanzone route, then you will pass a McDonalds. While you are following the A61 & 'Stadium / Metrodome' you will travel along a dual carriageway to a roundabout and back up the other side of the dual carriageway. This McDonalds is located on the roundabout, and is only about a mile or so from the ground. The mermaid fish and chip shop has been in business for over 20 years and is worth a visit, It is in the town centre, just off the main pedestrianised bit (May Day Green) between Bradford & Bingley and Dorothy Perkins. This fish & chip shop on Wellington street has been going for even longer and is extremely popular (eat-in only I think). 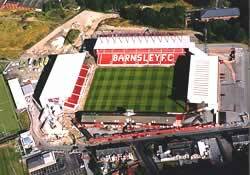 If you are a registered user then you can login, and create your own personal review of Barnsley Football Club - Oakwell. These reviews can be private or public.